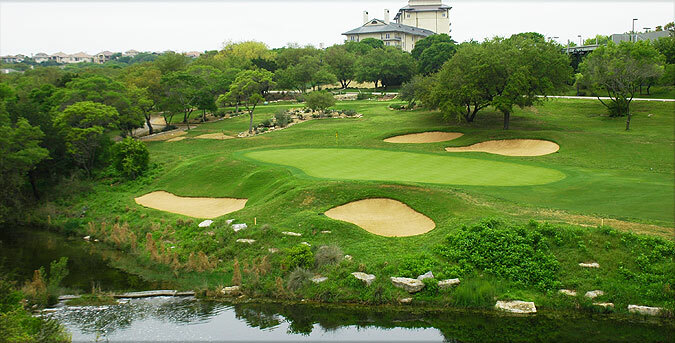 The Crenshaw Cliffside Course was designed by two-time Masters Champion Ben Crenshaw, along with Bill Coore. The traditional architecture features wide, rolling fairways that lead to a great variety of green complexes, most with large, sloping putting surfaces. There are 60 white, soft sand bunkers, situated along the landing zones off the tee and on approaches - with just 14 of them located on the front side. Water comes into play just twice - off the tee from the tips on number one, and in front of the green on the beautiful par four 18th. Of special note - there are no residential properties along this secluded layout! The four sets of tee boxes play to distances and slopes measuring 6630 yards/132 slope, 6152 yards/126 slope, 5660 yards/ 124 slope and 4726 yards with a player friendly slope of 110. . On course yardage blocks are posted at 100, 150 and 200 yards (and 250 on par fives) and sprinkler heads are measured to the center of the green on all par fours and fives. All par threes also have posted yardages at each tee area. Color coded flags on the greens indicate front, middle or back hole locations. There is generally plenty of room off the tee along the lushly tree lined fairways, so golfers of all skill levels can experience an enjoyable round. Even avid players however, will be challenged by the green complexes - which feature firm, TifEagle putting surfaces. The bump and run can be used often, as greenside mounding is minimal and just a few of the greens are heavily bunkered. Flop shots will also come in handy, especially on the numerous greens that slope from back to front. Golfers beware - there is generally more break on these putting surfaces than seems apparent! There is a great variety in shot values on this layout. The par threes are generally long, the par fours provide a good mix, two par fives are reachable and there is one par five - # 15 - which due to its uphill nature, plays extremely long and is basically unreachable in two. The two closing holes play over ravines/creeks that protect the raised green complexes - and are simply gorgeous! Caddies are mandatory on this course - and our guy Royce was extremely knowledgeable (especially helpful in reading putts) and was great company. For more info, visit our page for the course, with direct link to their website by clicking here.